At the Council’s Work Meeting on Mon. April 15, 2014 the Council discussed how the Council’s policy goals and vision for improving the downtown Provo area may be met by Downtown Provo, Inc. The presentations and discussion focused on setting benchmarks for the organization. An introductory presentation to the discussion of benchmarking Downtown Provo, Inc was offered by Council Policy Analyst Bryce Mumford, who drew on Vision 2030, Provo City’s General Plan, City Code, and other policy documents to determine which priorities the Council has considered for the future of downtown Provo, which could then assist in the creation of benchmarks for Downtown Provo, Inc. The policy review to determine purpose and role for Downtown Provo, Inc. produced the following areas of focus. Maintain the downtown Provo area as a vibrant center for business, financial, government, and retail services and cultural activities in Provo. 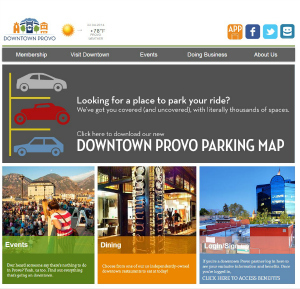 What measures best offer a view of the effectiveness of Downtown Provo, Inc (DPI)? Are there other measures not identified in this report that Council Members are interested in establishing some sort of tracking mechanism? Are there any of the 2013 Benchmarks that Council Members are not interested in keeping? Are some measures best left for consideration in later years? Mike Buonomo, Director of Downtown Provo Inc. then also offered a brief presentation to discuss benchmarks for the organization. If you’d like to review the presentations and the discussion about the particulars of how established benchmarks would be applied, you can watch the video of the Council’s Work Meeting, beginning at minute mark 59:43. If you have feedback or comment for the Council regarding Downtown Provo, Inc and how to benchmark the program, you may either leave a comment on this article, or contact your Council Member directly here.